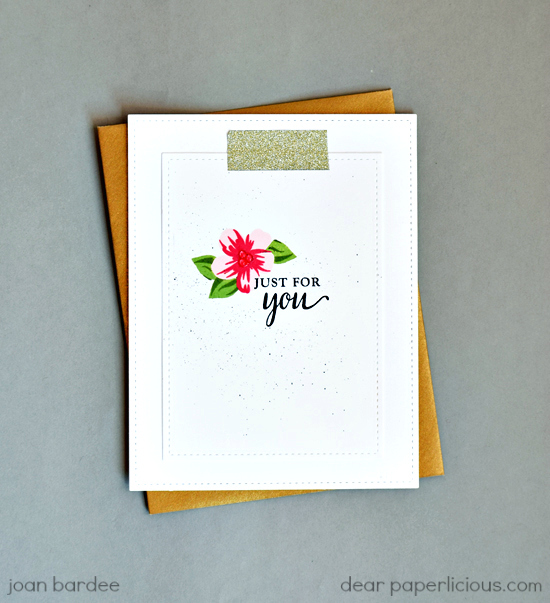 Used the For You Flowers, Coloring Layers set from Hero Arts to make this quick card. Masked the flower to tuck the leaves, speckled some Ranger Distress Black Soot Paint. Other supplies include Paper Source Luxe gold glitter tape (found it in my Christmas stocking! ), Lawn Fawn stitched rectangle dies, and a Paper Source Antique gold envelope. This is going in the mail today! Joan, this is simply gorgeous. Beautiful! I love the little pop of gold at the top, too. Fabulous! So simple yet stunning- my kinda card! Wonderful! The flower and gold is perfect.